This will of course not be a document learning you how to fly, but will standardize AD's pilots know-how and procedures and will make us more professional in our flights. I guess it adds to the immersion as we have to follow certain modified parameters for approaches and planning. Of course, no one is obliged to follow them, but they enhance the safety of our flights, just as the real FCOMs do. for today I've prepared a somewhat more complicated topic. Of course I'll keep it as short as possible. 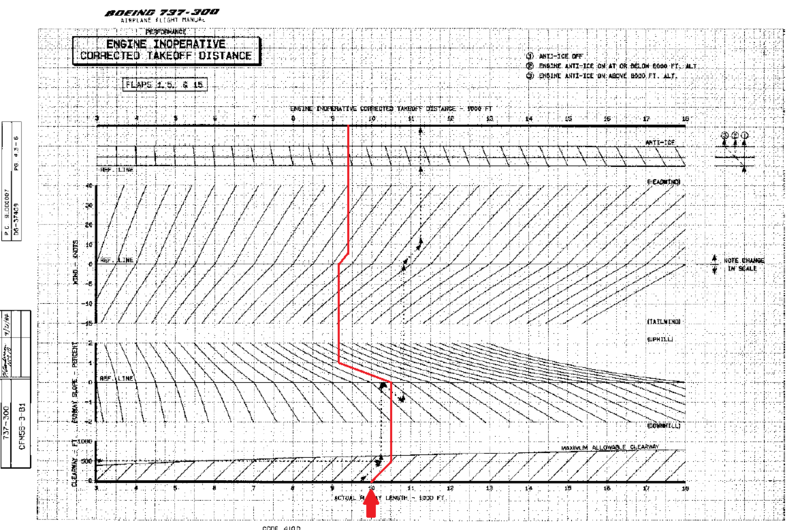 I want to share with you the way a pilot would compute his takeoff assumed temperature to derate and lengthen the life of his engines in a Boeing 737-300 with B1 engines (20K rated thrust). 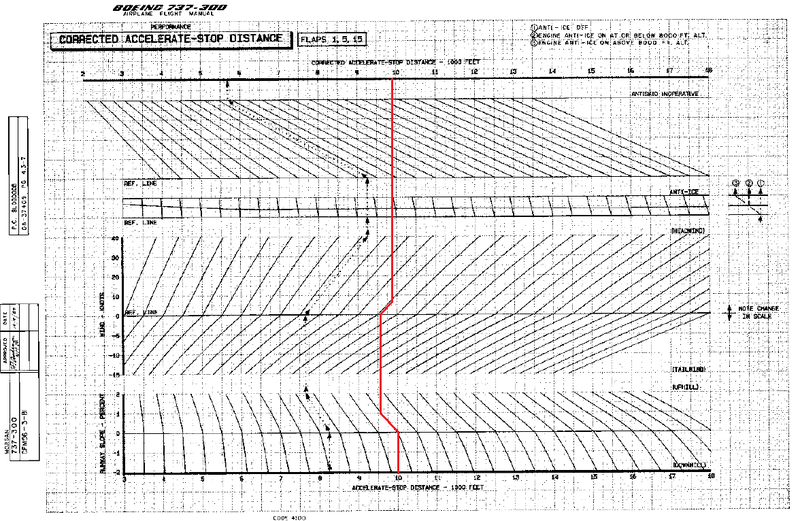 This method applies to all derate-capable airliners but the charts only apply to the 737-300 20K variant. Furthermore, in real life, pilots usually get this info already computed from a dispatcher office, but it doesn't hurt to know . The reason for doing this and the up-coming application is because there are no takeoff and landing performance profiles out there for the IXEG B737-300 Classic and I need one. The method for computing anything related to airliners can be found in a "little" document published by the manufacturer called the Airplane Flight Manual (AFM). Unfortunately I have a very poor resolution copy of the B737-300's AFM that I found on the Internet, but it'll do. Maybe I should first write a bit about what an assumed takeoff temperature is for the beginners out there. The plague of any engine is the high temperatures reached inside it. Materials that compose the engine are prone to thermal fatigue that adds up throughout the lifespan of an engine so engines need to be checked and overhauled periodically to lengthen the life of an engine. The temperature reached inside an engine is directly proportional to what is called the N1 rpm of a gas turbine engine (tubojet, turbofan and turboprop). The N1 rpm is the speed of rotation of one of the engines axes (usually they have 2, but there are with 3 and even with 1). So the faster an engine spins, the more fuel it needs to keep the rotation and thus the higher the temperature. In the same time, a gas turbine engine is governed by a computer that maintains its' stable regimes, a feat that a human will not be able to do - not unless he/she wants to also fly the plane. The computer takes inputs from different sensors and after they go through a black box the adjustments are applied to the engine. The inputs are usually related to pressures in different parts of the engine cycle, fuel flows and temperatures in different parts of the engine cycle again. One of the main inputs that any kind of turbine engine takes in is the outside temperature, the temperature of the air before entering the engine. This, coupled with the pressure at the inlet can give the algorithms a good approximation of the air density entering the engine for combustion purposes. Usually, at a sea level temperature of 15o C and a sea level pressure of 1013.25 mbar or 29.92 inHg (ISA atmosphere), any engine should be able to reach its' maximum N1 rpm (100% N1). This means that the maximum engine rating is reached in ISA atmosphere at sea level, which is expected. This also means that if you go to lower temperatures and higher pressures you can reach higher N1 ratings and vice-versa in higher temperatures and lower pressures. Lower is definitely not a problem, though higher N1s are because of mechanical stresses at higher rpms that destroy the compressors' and turbines' blades. In any case, the air temperature is a factor affecting the maximum N1 output (and inside temperatures and material fatigue). The higher the temperature, (the lower the density) the lower the rpm, temperature and fatigue inflicted. So manufacturers added a feature in their airliners that gives the pilot the possibility to fake the outside temperature and make the engine governor think it's warmer outside and in turn lower the fatigue inflicted on the engine at takeoff. You may think it's a breach of flight safety because now you don't have the maximum power available at your disposal from the engines. But that is solved by putting in safety overrides that can disregard any temperature derate - don't forget that the engine governor knows the actual outside temperature, this is just a gas pedal pull-back, NOT a hard limit. Another thing you may think about is how can the airplanes takeoff if they don't have all the available thrust at their disposal. Well, runways are usually much longer then what the airplane actually needs for the takeoff run. So you eat up a little more runway but you save up a lot of the engine lifespan. It's a good compromise. And as you will see, the computation is highly related to the length of the runway. The procedure involves looking up and matching values in manufacturer published plots in the AFM. The first step is to get the corrected runway length. This is a value that corrects the actual runway length to the known airplane characteristics and to runway weather conditions. The next step is to get the maximum assumed temperature the pilots can use in the two possible takeoff limits: field limit and takeoff climb limit. 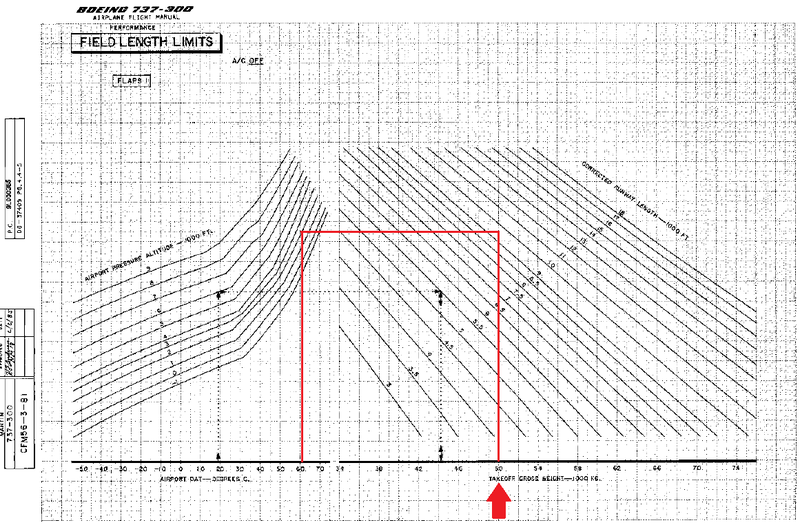 The field limit assumed temperature is dependent on the corrected runway length while the takeoff climb limit is dependent only on the takeoff weight and it assures a normal climb gradient after liftoff. This is the quick rundown of the procedure so let's get to an actual example and see what plots to use and how. So let's say we are taking off from an airport that is 2'000 ft above sea level (pressure altitude) and we want to take off from a runway that is 10'000 ft long and has a +1% slope. The aircraft takeoff weight is 50 tonnes (110'230 lbs). The wind has a 6 kts headwind component for the runway heading and the temperature is -15o C. And we will look for a flaps 1 takeoff (there are lots of plots for every parameter) and a 500 ft clearway from the runway end. Because we are equipped with a 20'000 lbs thrust we will use Appendix 9KS of the AFM for all our calculations. So we start from 10'000 ft and insert the 500 ft clearway. We then move to the runway slope reference line and insert the +1% slope. 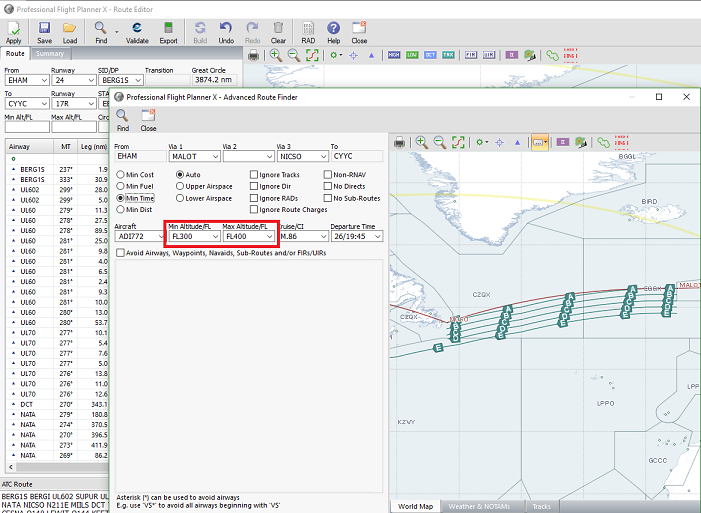 Next is the wind component dependency so we move to the reference line for the wind and insert the 6 kts headwind. Next is the anti-ice protection ON or OFF dependency but we have no clouds so no anti-ice. We thus get an all engine operative corrected runway length of 10'400 ft.
We again start from the 10'000 ft runway length and add the 500 ft clearway. We move through the same steps as in the all engine operative (though with different dependencies) and get the corrected engine out takeoff distance of 9'400 ft. This is a little more complex in concept. It is the maximum distance available to accelerate to a speed lower than V1 and decelerate to 0. The procedure is the same so we get a distance of 9'900 ft. This is an aircraft dependent feature. 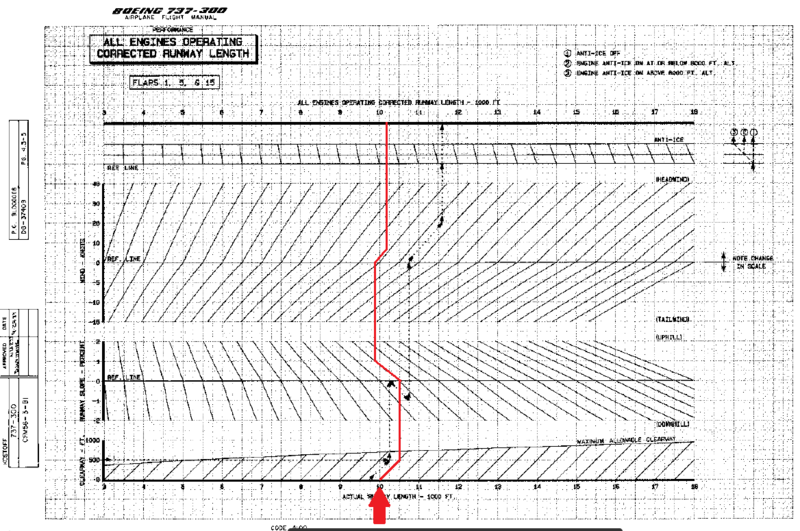 For the 737-300 20K there are 4 regions defined by the airport temperature and pressure altitude. In our case the -15o C and the 2'000 ft altitude sets us in the B region. The region defines what plots we use for the next step. As you can see we use the FLAPS 1 and REGION B plot. In this plot we enter with the corrected accelerate/stop distance and the corrected engine out takeoff distance and get 9'700 ft. 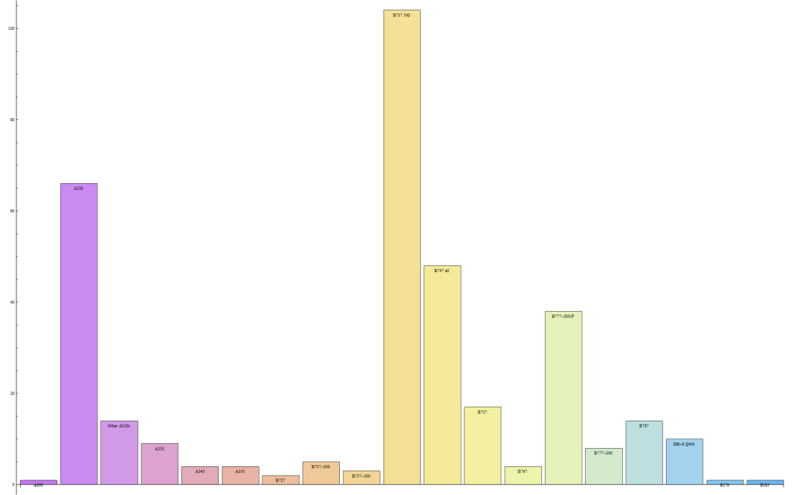 The ratio between V1 and Vr is .995. This is simple. The corrected runway length is the smaller number between the corrected emergency runway length and the corrected all engines operative runway length. So the minimum between step 1 and step 5 = 9'700 ft. So we enter the FLAPS 1, A/C OFF plot with the takeoff weight of 50'000 kg. At the intersection with our computed corrected runway length of 9'700 ft we move left and intersect the airport field elevation of 2'000 ft. We then can read the maximum assumed temperature given by the field length limit on the abscissa. 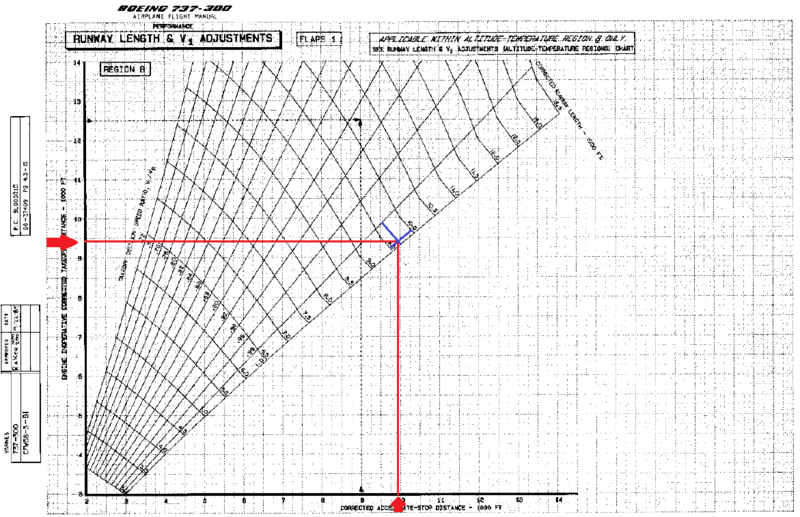 In our case we find a temperature of 60o C.
So we enter the plot with our takeoff weight and intersect the field elevation line of 2'000 ft and read the maximum takeoff climb limit assumed temperature on the ordinate as of being 47o C.
The maximum assumed temperature for engine derate is the minimum of the two temperatures found for field length and takeoff climb limits. In our case we can use a maximum assumed temperature of 47o C.
Of course, we can use a lower temperature to have better performance during the takeoff, but this is the maximum and still safe assumed temperature. Also, after the FMC computes your Vr you should recompute your V1 and modify it by using the ratio given in step I.5.. Otherwise, in case of emergency you will not have the correct takeoff abort speed . Because I hate to have my desk filled with papers and notebooks, I will definitely transform all these plots into an application (for Android most probable in Play Store so stay tunned) just as the guys making TOPCAT do . voiam doar sa va spun apropos de noul tur de discover GB despre care am primit e-mail ca ati uitat de EGLC. London City are un approach ILS pe 27 de 5.5o glide slope (fata de normalul 3). Este chiar frumos si destul de greu. Trebuie sa "fii gata" devreme si sa poti mentine Vref (greu cu un B737 si nu exista Cat II/III (autoland). Asa ca la 550 ft trebuie sa pui mana pe hățuri. Chiar mi-a placut. Am aterizat o data acolo, a fost "lunga si tare" ). so when should we (I) expect a livery for this new purchase I can't seem to leave it to rest ? Or should I start doing what I did for my A320...though you do it so much better . it's been more than 2 years since I've done one of these, so let's see what virtual pilots are favoring nowadays. Two years ago the conclusion was that PMDG and their NGX was taking the lot. Now we're going to do a more complex analysis. Now, we can easily place these models in a certain simulator like the B737-300 placing it in X-Plane (IXEG B737-300 Classic), or the B737 NG in the FSX/Prepar3D (I reluctantly named it Prepar3D, but let's give the Cesar what's his...). Of course, there are some models that cannot be placed in a definite super-class, and I am talking about the A320 here: we have the A320X from FSLabs for FSX/P3D but there are quite a lot of people flying the (still) beta and new Flight Factor A320 Ultimate. So, I am really splitting the A320 for X-Plane and FSX/P3D 50-50 because the FF A320 Ultimate is HUGE, while the FSLabs A320X is superb, but expensive. 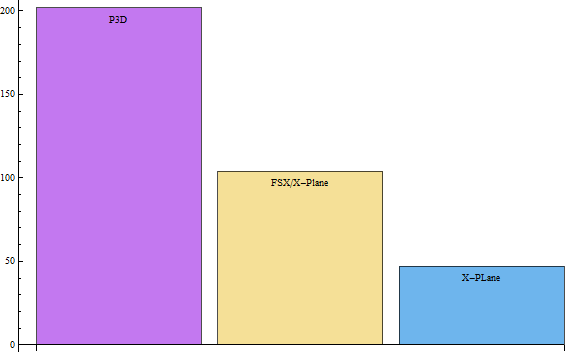 As you can see, pure X-Plane users are 25% of the P3d/FSX users, already a huge number, but the combined FSX/P3D/X-Plane users are more than half the FSX/P3D! With the releases of the v2 727, 757 and the new 767 (this is a long awaited thing for our community) plus the big X-Plane 11 release, I think this simulator is moving into a 50-50 era with P3D...and fast judging by how it looks in youtube videos (unfortunately, people are still just about the looks and less about the physics). so after you buy PFPX they give you a one year subscription to their services and as the saying goes "you don't know what you have until you loose it". 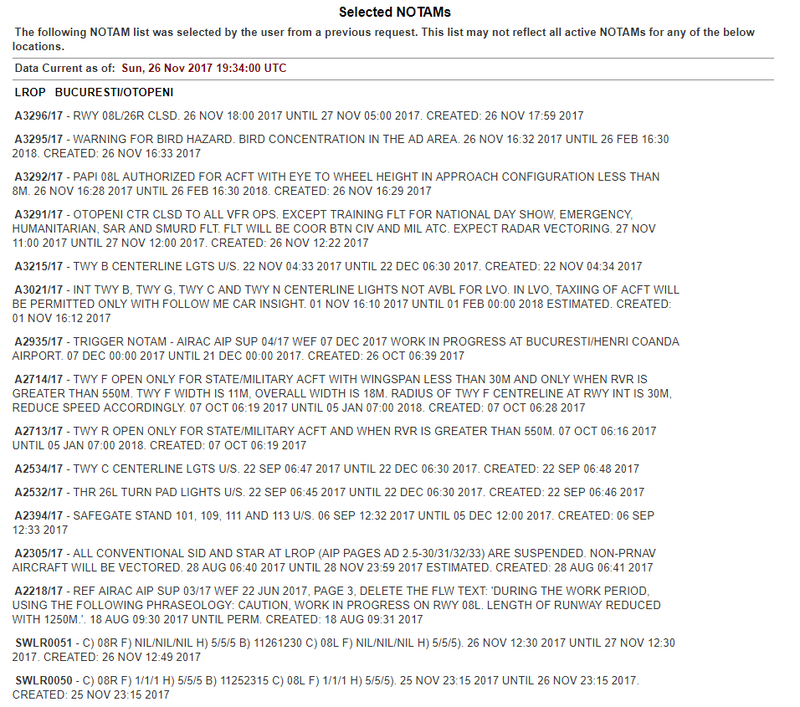 So after the year passes, there are three services that go away and in time you really miss them: weather, tracks and NOTAMs. While the weather subscription is the one that most PFPXers go after solving, the others services are actually even more important than the weather (and I'll tell you why). The weather service in PFPX is a static picture of the worldwide weather for a certain moment in time. Moreover, PFPX doesn't even care what moment in time the weather is for. If you do a plan for tomorrow morning this evening, the weather will be whatever weather PFPX read from its' sources (subscription - current weather - or other sources that you set up). So if your plan is a 9-hour flight then the departure weather will be useful, but the arrival one totally useless. Even for short flights, if you plan your flight at 2000z in the evening and you plan to fly at 1000z in the morning, then the weather will be quite different and fuel calculation may be quite different. So after the subscription to the Flight Simsoft servers expires and you have some other weather injector, you can make PFPX take the weather from it. 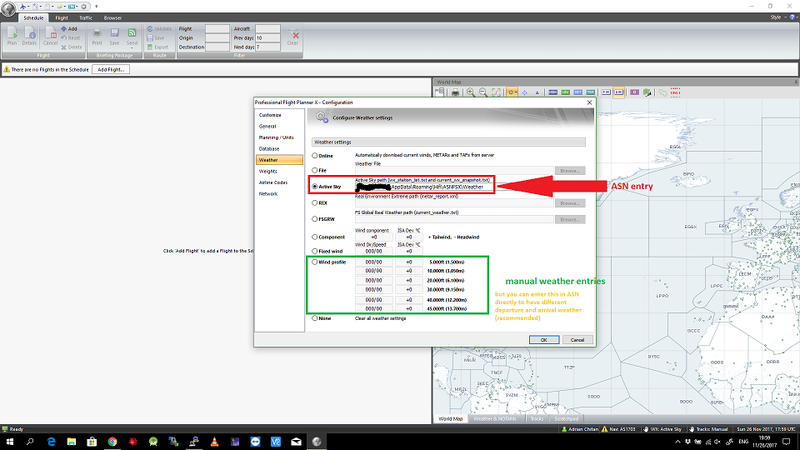 I use Active Sky Next so in my PFPX configuration, in the Weather tab I have selected Active Sky and entered the path to the weather instance file (<user folder>\AppData\Roaming\Hifi\ASNFSX\Weather). It is the folder that holds the wx_station_list.txt and the current_wx_snapshot.txt files. The good thing about ASN is that you can choose historical weather and even manually set up the weather. This helps because if I want to fly tomorrow morning (small to medium flight), let's say at 0800z, and do the flight plan today at 2200z, the weather will be quite off. But if you go into ASN and set it up to give you the weather for today at 0800z (24 hours before actual departure), the weather will match quite nicely (differences for 24 hours are minor). Even for long flights you can have a good estimation of the weather by setting ASN to give PFPX historical weather for when you take-off, or even better, for when you will be 1 third into your flight . Even more precise will be to set up the weather manually and set the departure weather as it was with a day before your departure, the long cruise part to be as it was a day before you entering that cruise part and the arrival weather as it was a day before again (or maybe 2 days before because when you make the flight plan you may be already 2 days before departure, but you get the gist). But this requires a piece of paper to write the weather parameters and then combine them into a weather pattern throughout your flight plan. Another subscription that you will miss is the tracks navigation subscription. This is nothing major for pilots flying intra-continental but should be quite a fuss for pilots flying inter-continental(ly). There are vast areas in the world that lack radar and/or ATC coverage. These are areas where the ICAO administration defines "highways" to separate inbound and outbound traffic so that no ATC intervention is required. These areas are the North Atlantic, the East Indian Ocean and Australia and the North Pacific. Airlines will always use these tracks when filing flight plans through these areas as they provide a higher level of flight safety. But, they are not obligatory! The North Atlantic tracks are called NATs (North Atlantic Tracks), the East Indian and Australian tracks are called AUSOTS (Australian Organized Track Structures) and the Pacific tracks are called PACOTs (Pacific Organized Tracks). 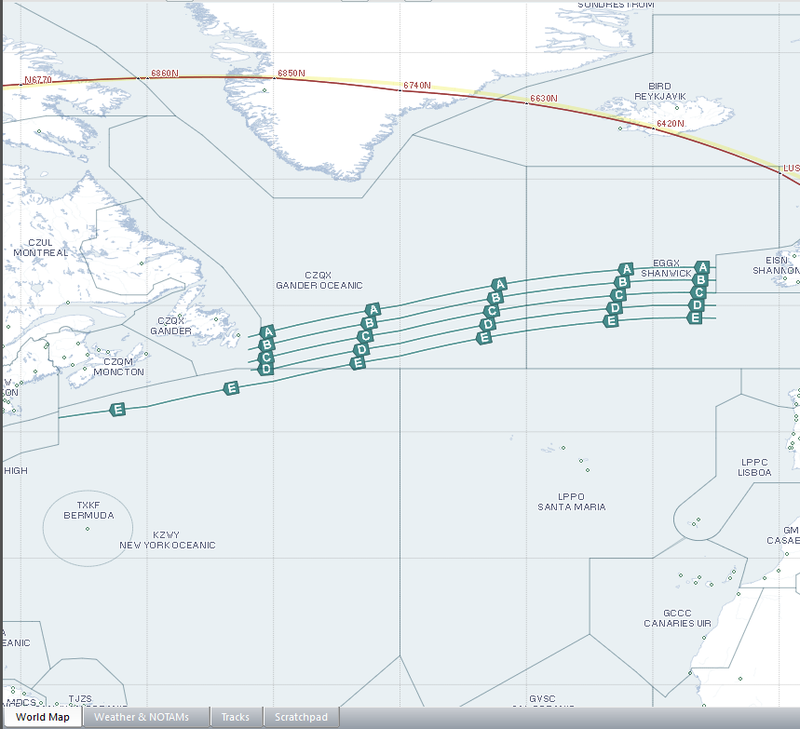 These tracks change everyday (they are computed to give the pilots the best wind to save fuel) and are published by certain ICAO entities which are actually the entry FIRs for the tracks. 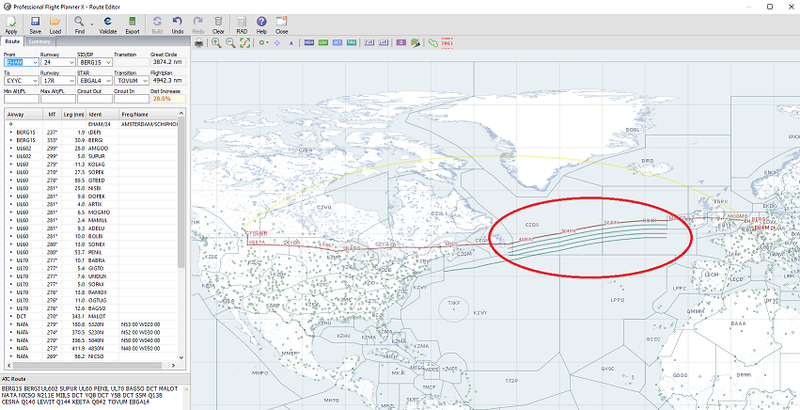 One thing to keep in mind is that the tracks are not published before the exit FIRs are open for receiving and landing airplanes, so the Westbound NATs (going to America) will not be published until 1000z because that is 0600L in North Eastern Canada. The good thing is that PFPX has a way of reading raw track defining messages for you to use and insert in you flight plan. In your main PFPX screen on the map screen there are 4 tabs underneath. The one called "Tracks" has another 3 tabs where you can enter the raw track defining messages and PFPX will automatically read them. To use them in your flight plans is another matter...read on. For NATs and AUSOTS you just copy-paste the message into the right track tab. For the PACOTs you have to check all entries (you have Check All buttons on the page) and then copy-paste the whole message into the Pacific tab in PFPX. And that's it! You now have the tracks defined in PFPX. Unfortunately, I have seen that PFPX doesn't automatically use the tracks in the flight plans even if the Ignore Tracks is unchecked. So here is what I do. Let's say I want to do a flight from EHAM (Amsterdam) to CYYC (Calgary) in Canada today (26.11.2017). As you can see in the bellow picture, PFPX didn't add any NATs in the flight plan because it has some other settings for auto generating a flight plan. So the thing that I do is to clear off the generated flight plan, then choose to Edit the flight plan, than Find->Advanced and then put the tracks in the Map (the Westbound NATs for this one). In the Via 1 and Via 2 (or 3) entries you have to put in the entry and exit points of the track you want to use. For this example I would use track A (NATA) so I have to put in the entry and exit for this track (above). 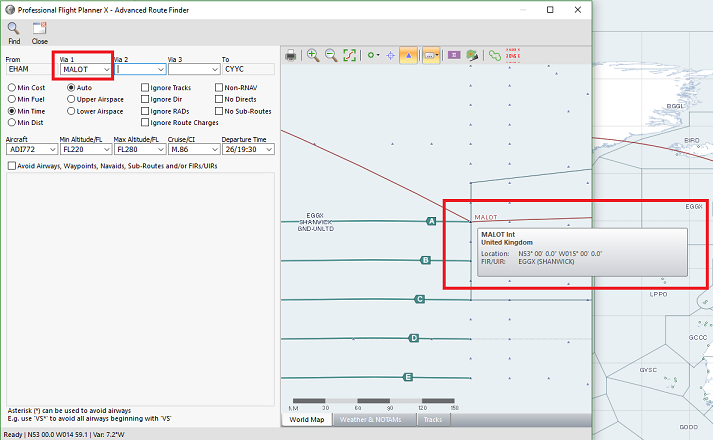 Another thing that you must not forget when you want to use PFPX to generate a track-driven flight plan is to choose the flight levels that are valid for the tracks. If you keep the mouse above a track letter on the map you will see range of flight levels that this track is defined for. NATA is defined for FL300 to FL400 so I put that in the Find parameters. 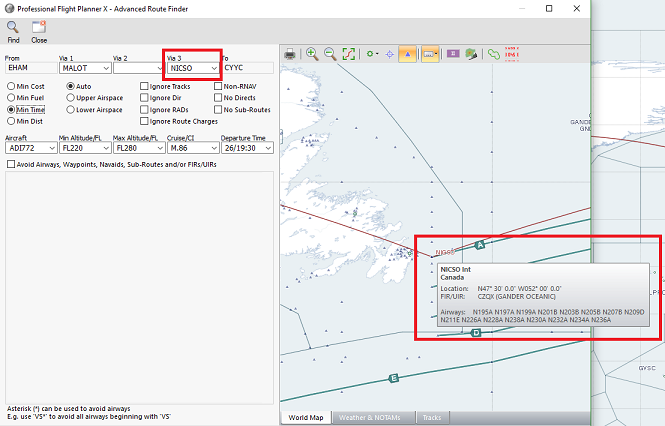 Pressing find will now generate a flight plan that'll take the NATA into consideration. And that's it! You now have a very safe flight to do for the next 10 hours. Yes, it's 28% longer than the great circle track, but airplanes don't fly short, they fly safe. NOTAMs are notes to airman that are published for every FIR and have time limits of validity. Pilots need to know all the NOTAMs that are valid for their departure and arrival airport, and also any diverts that are possible in the flight. NOTAMs can shorten runways, can warn on departure obstacles (temporary crane installments) or can warn on taxi lights being off. This is another service that is off after the PFPX subscription is void. But of course there are solutions. 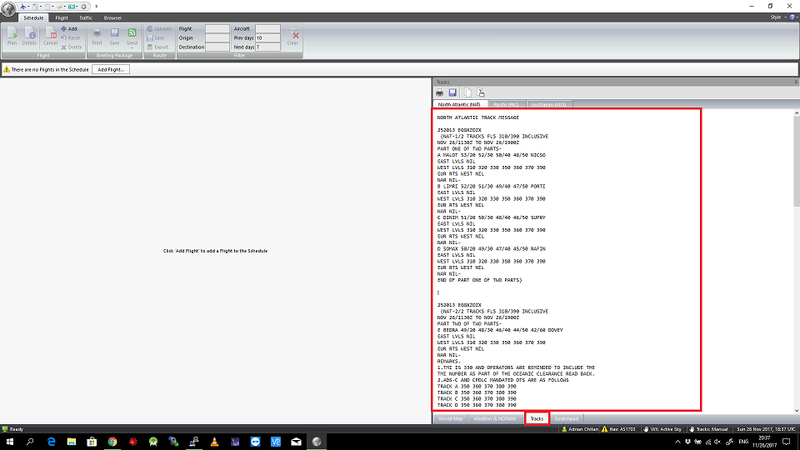 In PFPX, in the upper part of the main interface you have the Company Data tab->Company NOTAMS. In here you can add the NOTAMS by pressing the Add button. But you have to put in by hand the ICAO identifier it refers to and the validity time range which will take some time. NOTAMS for any part of the world can be found at https://pilotweb.nas.faa.gov/PilotWeb/ where you have to write the ICAO identifier you want. Bellow we have the NOTAMs in place for Otopeni. You will have to add them one at a time to actually have the validity time in place. Please download Version 1.0.1.1 in order for it to work please. Training Center / Why is ISA important? a little free time for a little post. So let's get into it because it's somehow advanced. So let's say two friends have both bought airplanes, one has a C172 and the other a Piper 180. One lives in Sibiu and the other in Bucharest. They both are eager to fly theirs and brag about the performances when they meet at airshows ). 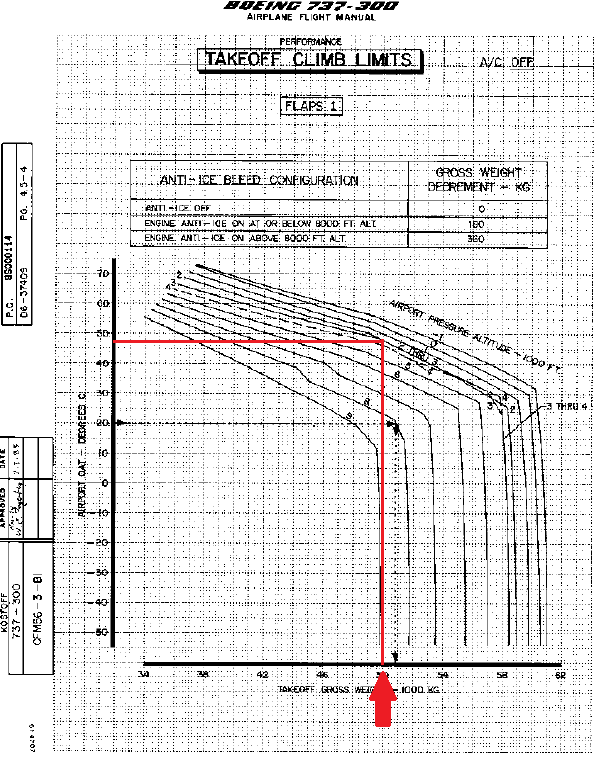 So, the subject of climb profile (plotting altitude over time) comes into discussion as a good method of comparing the two planes. So they both agree to climb at the best climb speed to 10'000 feet. Comparing the profiles will set the dispute. But they live in different cities, with different weather and to top it all off, one is recording his climb during the winter, while the other in the summer. So, putting their profiles together actually means nothing. It's like comparing apples and melons because the two planes didn't fly in the same fluid. 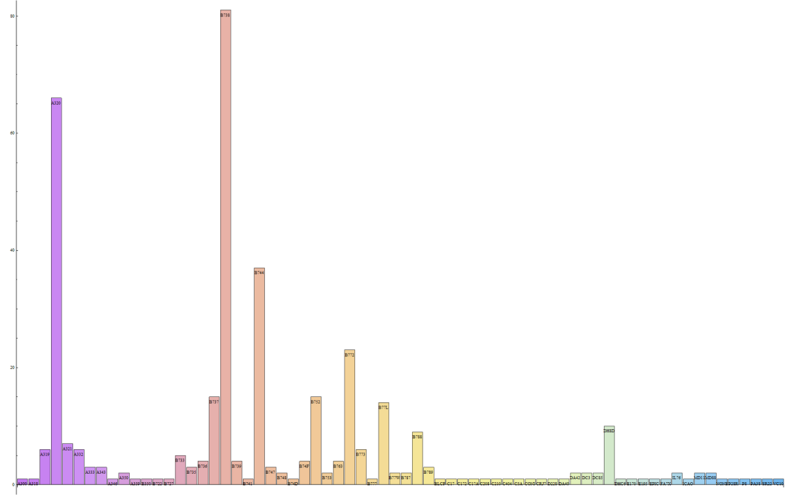 That's why ISA was invented to standardize performances of airplanes. International Standard Atmosphere is an artificial atmosphere defined by a sea level pressure of 1013.25 mb (101'325 Pa) and temperature of 15o C (59o F, 288.15 K). Using the barometric formula, one can compute the pressure and temperature for any altitude in ISA. 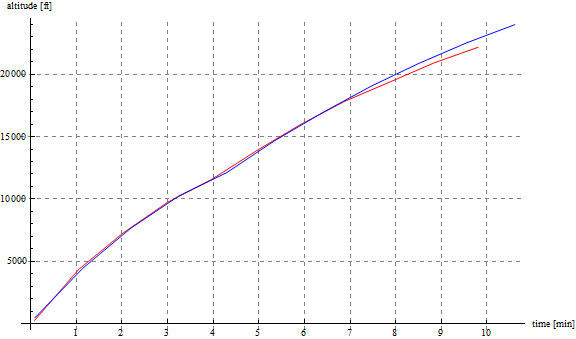 So before comparing the two climb profiles each pilot has to convert the real climb profile into the ISA climb profile. To be able to do this, the pilot doesn't just have to write the altitudes and times on a piece of paper but also the temperatures (OAT for our small planes, TAT for larger ones). 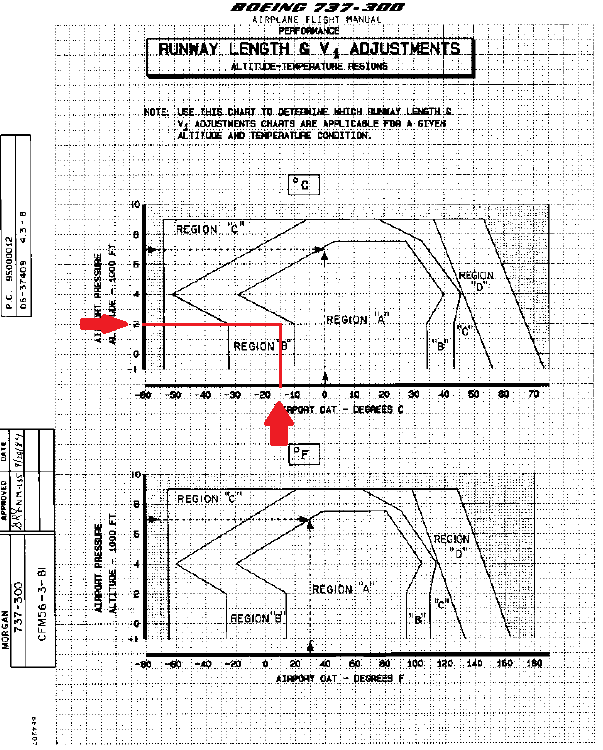 But this can be skipped if the precision is not so important, so the pilot can only note the airfield OAT and compute temperatures as ISA deviations. Having the real densities of the air, we can translate these into ISA altitudes by reversing the formula and changing t0, ti and p0 to the ISA values. And there is one more thing to do. The vertical velocity indicator is an absolute indication of the climb rate, be it ISA atmosphere or not. Meaning that it shows the correct climb rate in any atmospheric conditions (except really extreme temperatures). So, this means that even in ISA conditions, the two planes would have the same climb rates between the altitude readings. That translates into different times than the times read by the pilots during the climb. So we can use the rule of three to get the times between the ISA altitudes and make an ISA time chart which will be different than the real climb time values. Because the ISA climb doesn't start from an altitude of 0 (especially if the airfield is not at 0 MSL), the pilot can extrapolate the first climb to starting from 0 MSL by keeping the same climb rate as the first climb segment. This can sometimes give a start time less than 0 but that is not a problem. 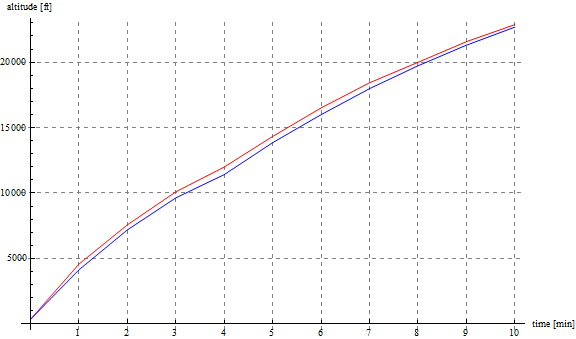 So, now the two pilots have the ISA altitudes and the ISA times which we can use to plot the ISA climb profile. They can thus compare the performance of the two climbs. Some initial observations on the conditions, as you can see the winter atmosphere starts at a lower pressure (bad for flying), but the temperature is also much lower (good for flying), while the summer atmosphere starts off at a higher pressure (good for flying) but much higher temperature (bad for flying). Also, the takeoff and climb procedures were: MTOP until VCLIMB, then MCL still on VCLIMB up until 10'000 feet and then still MCL but IAS 180 for the rest of the climb. The readings were made every minute for 10 minutes. the lower temperature in the winter leveled off the effect of the higher pressure of summer. At 18'000 feet the winter climb clearly overtakes the summer climb because the temperature effect has a greater magnitude than the pressure effect. So, on the whole, during the winter, the plane performed better as opposed to what the un-reduced to ISA climb profiles showed us.